This treaty ended a struggle among three brothers for possession of the empire consolidated by their grandfather Charlemagne. Charlemagne revived the Imperial August Title of Roman Emperor in the West, in the year 800. According to Carolingian theory, the Roman Empire had merely been suspended, not ended, by the abdication of the last Roman Emperor Romulus Augustus in 476. Charlemagne persuaded Alcuin of York, considered the greatest scholar of the day, to come to his palace at Aachen (Aix-la-Chapelle) and establish a new school to train clerks and scholars in classical Latin. Every year, both counts and bishops attended a general assembly where they would advise the emperor and hear his directives. The relationship between Church and State, which dated from the reign of Roman Emperor Constantine I, was generally accepted, although in practice, one of the partners inevitably tried to dominate the other. The Imperial office was technically elective, the Golden Bull of 1356 issued by Emperor Charles IV reaffirmed and regulated the election procedure. At the free imperial city of Verdun, peace was concluded in 843 between the three surviving sons of the Carolingian emperor Louis I (the Pious), who had died in 840. Under the terms of the agreement, the empire was divided into three parts. The oldest son, Lothair I, who had succeeded his father as Holy Roman emperor, received the central portion of the empire, including Italy, the Low Countries, Alsace, Lorraine, and Burgundy. 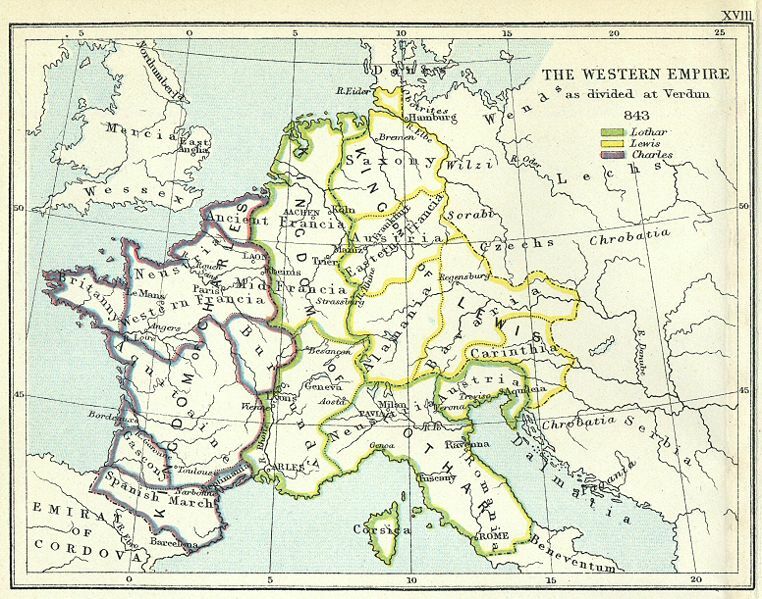 Louis II, who was established in Bavaria, was given control of the eastern Kingdom, which came to be known as Germany. This name derives from the Latin "Lotharii Regnum", the realm of Lothair, and early in the 10th century appeared in written records as Lotharingia. Lothair subsequently divided this central portion among his three sons and retired to a monastery. After the death of Lothair II, Lorraine was divided between his two uncles in the Treaty of Mersen, 870. Henry the Fowler gained control over the divided lands, and united them as a duchy under the German crown. His son and heir Otto I, Holy Roman Emperor granted them to his brother, Bruno I, Archbishop of Cologne. In 959 Bruno divided the territory into two dukedoms: the duchies of Upper Lorraine and Lower Lorraine. (Upper and Lower refer to the watershed of the Rhine river) Upper Lorraine survived until 1766. Lower Lorraine fragmented into Brabant, Limburg, Gelre, as well as various bishoprics, counties and imperial fiefs. The Duke of Brabant traditionally retained the honorific title of Duke of Lothier. Lorraine was the object of territorial disputes between France and Germany for a thousand years.